Figures. Considering her connections with the Kennedy family, I wouldn't be surprised if they had something to do with her death. Grauman's, The Hollywood Roosevelt and the old Knickerbocker Hotel (now known as the Hollywood Knickerbocker Apartments), etc. are in that area. Actually I didn't stay at the Liberty Hotel... There is another hotel across the street from it, right next to the old apartment buildings. That was where we stayed at but yes orchid Avenue sounds familiar.. I wish I was interested in Ghosts back then as it'd have been interesting visiting the places you mentioned. We walked by the Hollywood Roosevelt several times ... Such an old building. BTW-- my roomie was the one that noticed that the ghost we saw was wearing a dress, so I asked her to describe it to me and she said it was blue, maybe flowery and looked like a 1960's dress.. I just saw the face and I know the ghost(she) had brown hair. Edited by katrahawke, 14 July 2005 - 07:44 AM. Those were very interesting, some I already know about, others I didn't. The Thelma Todd one is my favourite, since I've been interested in it for the past couple years. I've just started reading up on Marilyn Monroe in the past few weeks, and I may have to go raid my library for more books regarding the rest of those! Thanks for sharing! On the evening of Friday, March 5, 1982, Actor, Singer, Comedian John Belushi got together with several close friends (which included Robin Williams and Robert DeNiro) for a dinner party at "On The Rox", the Restaurant above the famous Roxy Nightclub on Sunset Blvd. After dinner, he invited Williams and DeNiro up to his temporary residence at Bungalow #3 at the Chateau Marmont. It was while there that, at his urging, he was injected with Cocaine and Heroin (a speedball - now, sadly called a Belushi) by Cathy Evelyn Smith (known to some as "Sundown" see the song by Gordon Lightfoot). His friends left while Cathy remained behind with him. After a while, John went into the bedroom to lie down for a time, so Cathy left. Later, John's manager tried to call him at the Bungalow and got no answer, so he went to check up on him. When he entered the bungalow and went into the bedroom, John was blue in the face. Brillstein tried unsuccessfully to revive John, but it was too late. John Belushi was dead. He called Police, Ambulance and then the Medical Examiner's Office. Not long after their arrival, the News Media arrived bringing with them crowds of people who looked on as John's body was carried out of the hotel in a body bag and placed into a van. It was at that moment that Cathy arrived back on the scene. When she saw what was going on, she turned her car around and fled. When Dan Aykroyd got the news in NYC that John was dead, he walked all the way to where John had lived with his wife Judith and told her the news. The Funeral for John Belushi was held in Massachusettes near Martha's Vineyard and he was buried in Chilmark. The funeral was attended by Lorraine Newman, Bill Murry and, of course, Dan Aykroyd of SNL. Dan was in full motorcycle gear. Sometime later, as a Psychic Medium was trying to make contact with the Dearly Departed in a well-known part of Hollywood, she allegedly came in contact with the spirit of John Belushi, who stated to her that he was just as shocked by his death as everyone else was. Why did he not cross over into the Light? There are several theories, one of which was that he had unfinished business in this life. A woman and her family had to temporarily move out of their home due to renovations so they checked into the Chateau Marmont hotel in Hollywood. Due to problems with the renovation, they ended up staying there for over a year. During this time, late at night, they would hear their young son (age 2) alone in his room laughing and giggling to himself. They thought nothing of it as the child is a very outgoing and playful child by nature. When they finally did ask what he was laughing at, the child would only say "the funny man". So one night the woman was talking to her friend about all this and her friend mentioned that John Belushi had died in the Chateau and that there were many reports of his spirit still roaming the grounds. A friend of hers did a quick search online and asked her if they are staying in Bungalow #3. She said yes. Apparently, the family had been living in the same bungalow that John had died in. Some initial thoughts were to take pictures of various actors and show them to the child to see if he could recognize "the funny man" but, according to the mother, this never came to fruition. A friend of the boys mother visited the bungalow while they were staying there. It was for a birthday party for the boy and while it was a bit creepy, nothing out of the ordinary was said to have happened. Until later. After a time, the boy began to complain that he wasn't sleeping well because of the "funny man" who would awaken the boy and want to play with him and make him laugh. The mother of the child was sitting in bed one night she was sitting in bed one night looking at a book about the Chateau Marmont, and her son wandered in. He was very interested in what she was looking at so she told him it's all about the Chateau as she turned the pages ... there were many photos of various celebs that have stayed there over its many years. So the kid would say, "who is that?" And she said, oh that's an actor who was popular when your grandma was younger ... and that's Robert DeNiro, that's Robin Williams ... etc. Then she turned the page. The child got very excited, pointed and said: "Look, Mommy, there's the FUNNY MAN!" He pointed right at the picture of John Belushi. No, they have never shown him photos or Belushi films; in fact, when we suggested it a long time ago she said "no" so this kid has had no prompting whatsoever. But he sure did recognize his "funny man" right away! Although she hadn't been afraid to go to the bathroom alone at night since she was 8 years old, she was very uncomfortable doing so when they were staying in Bungalow 3. She said she would run in and out quickly, and never made eye contact with the mirror; she just felt as if she was being watched all the time. She went on to say that every time she opened the door to the room/area the kid was sleeping in, to tuck him in at night, she felt what she can only describe as a "whoosh!" I wouldn't rule Gable out. Does anyone know if the stars of I Love Lucy haunt anyplace in Hollywood? I read that William Frawly (Fred Mertz) collapsed on Hollywood Blvd. in 1966. Very cool stories! Not surprising that there are so many still around , they had strong, charismatic personalities. While vacationing in Los Angeles, I went out to Holy Cross Catholic Cemetery in Culver City to take some pics of some celebrity graves. I got pictures of the graves of Sharon Tate, Bing Crosby, Bela Lugosi, Rita Hayworth, Rosalind Russell and wanted to get pictures of several others. As I was searching (in vain) for the grave of Mr. Jimmy Durante, I happened to look to my left and I saw, standing about 30 yards away, a young man who looked to be in his late 20's gazing at me. It was around Noon. He was a white male, about 5' 10' with thick, black well kept hair. He was wearing a long sleeve, white dress shirt and black suit pants. He looked at me in such a way that I thought he was annoyed with me or just curious. I took my eyes off of him for approximately 3 seconds while I got my bearings once again and then glanced back his way to give him a smile and a wave. Much to my puzzlement, though, he was gone. I scanned the area where he had been standing and he was nowhere to be found. In the particular area in which he'd been standing there are no trees and there is absolutely no way possible that he could have gotten out of sight so quickly unless he'd had a jet engine strapped to his back. One moment he was out in the open, the next, he was gone! My puzzlement became astonishment as I realized it was a ghost I saw. This ghost, however, looked slightly familiar, but I just couldn't place him. About a week later, after I had returned home, I started scoping out the Find A Grave website for celebs graves I'd missed. I clicked on one name and as I looked at the face of the actor there, I gasped! Before me was the very face of the ghost I had seen in the cemetery. There is absolutely no doubt in my mind that I saw the ghost of Vince Edwards. Who was Vince Edwards? 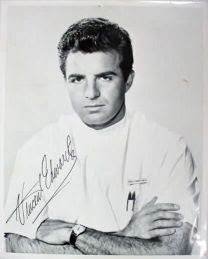 In the 1960's he was best remembered as Dr. "Ben Casey". It was once a Fortress, then it was a Prison. THE Prison. If you got sent there, it wasn't to be "rehabilitated", it was to be punished! Some of the inmates there included Arthur "Doc" Barker, George "Machine Gun" Kelly, The Purple Gang, Robert Stroud (The Birdman of Alcatraz) Sam Shockley, Floyd Hamilton (The Barrow Gang), members of the Barker/Karpis Gang and of course, Al Capone. The penitentiary was closed on March 21, 1963, upon the orders of Attorney General Robert F. Kennedy. After the close of the infamous prison, movies were filmed about the prison or about some of it's more infamous inmates. Some of the films about Alcatraz or filmed at Alcatraz include: "The Rock", "The Birdman of Alcatraz", "Escape From Alcatraz", "Murder In The First", and "The Enforcer". But movies aren't the only strange things about Alcatraz. The former federal prison is haunted. Visitors have reported paranormal encounters there. Voices have been heard in empty prison cells, the Hospital Ward and in the Dining Area. Footsteps have been heard walking down corridors, but when someone went to investigate, no one was there. There have also been unexplained cold spots. Cellblock doors have been heard slamming shut for no reason or explanation. Finally, there are the screams. D Block is especially haunted. It is underground and the prisoners were taken down there were usually taken there to be put in Solitary Confinement. The Cell in D Block was called "The Hole". The only thing that awaited you there was a hole in the floor to go to the bathroom, a small steel shuttered opening to get food and water, a straw mattress, and once the cell door was closed....complete Darkness. One incident which took place during the 1940's was when a particularly hard-nosed prisoner was locked in the Hole for some infraction which has now been long forgotten. Within five minutes of being locked in the darkness of the Hole, the inmate began screaming. He claimed that there was some creature in the cell with him and that it had glowing red eyes. The Guards didn't take him seriously even after claiming that the thing was attacking him. His screams sounded thru the cell block for the next couple of hours. When the Guards went to check on the inmate the next morning, they found him quite dead. The Inmate had a look of abject terror frozen on his face and on his neck were the clear prints of hands. An Autopsy concluded that the inmate had died of strangulation....and fright. The Guards were examined and it was concluded that none of the guards had attacked the screaming prisoner. The day after the mysterious event, several guards who were performing a head count noticed that there were too many men in the lineup. I had forgotten about this thread. It resurfaces at a great time! I got some news recently from a friend of mine out in LA about some more ghost activity. A man living in a house in the Hollywood Hills awoke one night to find a man standing at the foot of his bed. The ghost looked desperate and was pointing out the window of the bedroom, up the hill to where once stood the house of Roman Polanski and his wife, Sharon Tate. From a picture, the man recognised the ghost as Jay Sebring. My theory is that something at that location has caused the respective spirits to be disturbed or there is an event that has occurred or will occur that has things out of flux, if you will. One thing which I know is happening is that Susan Atkins of the Manson Family and one of the people present on the nights of the Tate/La Bianca Murders, is dying. She is in the advanced stages of terminal brain cancer. She is paralized on her right side, can barely talk and has had her right leg amputated. She could die any day. She has asked the State of California and the Prison Parole Board for mercy and that she be released from prison so that she can die peacefully at home. Her request was unanimously denied. The TV Show "Ghost Hunters" also did a feature regarding the Tate Murder site. There were allegedly some EVP's (Electronic Voice Phenomenon) taken and physical as well as meteorological phenomenon documented. I've been trying to find the videos of that particular episode, but have had no success. Susan Atkins died on September 24, 2009, at the Central California Women's facility in Chowchilla. Her body was cremated and given to her husband. Can Ghosts really hurt you? Good question, that one. Yes. They can hurt you, but ONLY if you give them the power to do so. Ghosts have but one weapon which they can use against you: Fear. Nine times out of ten, I would just bet that if you spent time in the apartment of the late Heath Ledger, only one thing would happen: someone would be along to collect the rent! On the other hand, some places, such as certain places located in Hollywood are indelibly marked with a kind of psychic scar. Chilling........ Can't wait to see the pics. Poor Sharon she came to such a violent gruesome end . She had a premonition I as I recall. Edited by Beatlefish, 11 May 2006 - 07:35 PM. In the early morning hours of Saturday, August 9, 1969, Manson family members Charles "Tex" Watson, Susan Atkins, Patricia Krenwinkel and Linda Kasabian, murdered Steven Parent, Jay Sebring, Abigail Folger, Wojciech Frykowski and the 8 ½ months pregnant, Sharon Tate. After cutting the line and moving the car down the drive, Charles "Tex" Watson, Susan Atkins, Patricia Krenwinkel, and Linda Kasabian walked up the street and climbed over the embankment right of the gate. Edited by KlaineyGStudy, 29 July 2018 - 09:43 PM. Here is an update regarding the death of Paul Bern. As a result of his death, several federal crimes were commited. To avoid a scandal, MGM fabricated a story and evidence which brought the cornoner's jury to the conclusion that Bern had commited suicide because of impotence. A friend of Paul Bern, Samual Marx arrived at the house on Easton Drive in Benedict Canyon to discover that Irving Thalberg, an Academy Award-winning American film producer was tampering with evidence at the scene. Los Angeles District Attorney Buron Fitts was even bribed by MGM to "keep a lid" on the case. In the 1980's, the case was reopened and investigated by Marx and every piece of available evidence was carefully scrutinized. It was concluded that Bern did not kill himself, but was in fact murdered by his former common law wife Dorothy Millette, who committed suicide two days after Bern's body was discovered. Unfortunately, the verdict of suicide has not been changed, even though a woman fitting the description of Dorothy Millette was seen in the vicinity of the house on the night of Bern's death. Was it perhaps some solitary piece of evidence that Bern's ghost was seen searching for by a frightened Sharon Tate, a piece of evidence which would have cleared his name and pointed a ghostly finger at the real killer? On the Sunset Strip, in the heart of Hollywood, there once was a high class joint called Ciro's. It offered top entertainment and catered to the rich and famous, being one of the busiest hangouts for successful, well-known film industry people from both sides of the camera. But beneath the glitter of this place, there lurked beneath its surface, a dark side. One of the people that also frequented Ciro's was none other than Mickey Cohen, said to be the successor to Benjamin "Bugsy" Segal. If people thought that "Bugsy" was a force to be reckoned with, it was even moreso with Cohen. He was said to shake the place down on a weekly basis and those unfortunate enough to cross him usually were taken down into the basement, beaten to a pulp and then fitted with a new coat of concrete. Is the place, which is now called "The Comedy Store" haunted? You bet! It is said to be haunted by at least five ghosts which have manifested themselves by moving chairs, messing with the lights or even appearing to startled employees or patrons. One comic that had more than one encounter wtih the ghosts was Sam Kinison. The ghosts hated him and would do anything they could to disrupt his shows. Loud, ghostly chanting could be heard at times saying, "It's him! It's him!!! It's him!!! They also messed with the sound system and the lights and such. One night, Sam got so annoyed with the ghosts that he challenged them to show themselves. All the lights went out, plunging the place into darkness! No one goes down into the basement because it is said that something dark and malevolent dwells down there. A Security Guard once went down there to investigate a noise and heard a low, animalistc growling at around 3AM. Then, to his astonishment, something hit the basement door so hard from the other side that the door bowed outwards. The Guard didn't stick around to see what it was. He was off! The Comedy Store is located at 8433 Sunset Blvd. in West Hollywood.